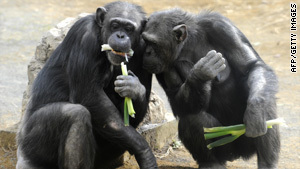 These two chimps may be exchanging diet tips. Hoover the seal tells aquarium visitors, "Get outta here!" or asks "How are ya?" Blackie the cat taught to say, "I love you" and "I want my mama"
(Mental Floss) -- There's no need to page Doctor Doolittle for this case. Here are the amazing, true stories of four animals that could speak for themselves. When he got too big for the tub, Hoover was moved to a small pond behind the Swallows' house. After only a few months, Hoover was eating more fish than his human caretakers were able to provide, so they contacted the New England Aquarium in Boston, hoping the facility had room for him. When introducing the seal to the aquarium, George mentioned that Hoover could talk. Of course no one believed him at the time. A few years later, though, researchers at the aquarium noticed that Hoover's guttural sounds really did seem to be forming words and phrases. He was often telling people to "Get outta here!" or asking, "How are ya?" He could say his name and a few other phrases, all with a thick Bostonian accent. Once the word got out that the Aquarium had a talking seal, he became a media sensation, making appearances in Reader's Digest, The New Yorker, National Public Radio, and even on Good Morning America. Search YouTube for "Talking Cat" and you'll find thousands of videos of fluent felines. But in 1981, a talking cat was a bit harder to come by. So when Carl Miles of Augusta, Georgia, trained his cat Blackie to say, "I love you" and "I want my mama," they took their act on the road. Throughout the early 1980s, Blackie made paid appearances on local TV and radio programs, and even hit the big time with a spot on the network TV show That's Incredible. However, as the novelty wore off, Carl and Blackie ended up performing on street corners, asking for donations from passersby. After some complaints from locals, police informed Carl that he would need to get a business license in order to keep up Blackie's street show. Carl paid the $50 fee for a license, but something about it rubbed him the wrong way. So Carl sued the city of Augusta, under the pretense that the city's business license code mentions many types of occupations that require a license, but a talking cat show was not one of them. But that wasn't the only issue Carl had --he also claimed the city was infringing on Blackie's First Amendment Right to Free Speech. Alex, an African gray parrot, was purchased from a Chicago pet store in 1977. Dr. Irene Pepperberg bought the one-year-old bird to see if she could teach a parrot to understand language in a similar manner to chimpanzees and gorillas that had been taught American Sign Language. At the time, it was believed that a large brain, like a primate's, was necessary to acquire language. By comparison, a parrot's brain is about the size of a walnut, so it was believed that mimicry was the best we could hope for. Instead, the work of Pepperberg and Alex (an acronym for Avian Learning EXperiment) before his sudden death in 2007, has changed the perceptions of many in the scientific community. According to Dr. Pepperberg's research, this avian Einstein could identify 50 different objects, knew seven colors and shapes, and many different kinds of materials like wool, paper, and wood. For example, hold up a blue block of wood and Alex could tell you the shape, the color, and even what it was made of. However, he also grasped more complex concepts that required a higher level of thought and understanding. Put a handful of red and yellow blocks on a tray and ask him how many were yellow, he could tell you the correct answer. If you then asked him how many of those same blocks were green, he would say "none." Furthermore, hold up two blocks of different colors and different sizes and he could tell you which was bigger. Maybe the term "birdbrained" isn't such an insult after all. Despite the loss of Alex, the Avian Learning Experiment goes on. Dr. Pepperberg's latest feathered pupil is Griffin, another African Gray, that was born in 1995. In 2007, Animal Planet tested Griffin against kids at a Boston preschool on the basics of object recognition, colors, and shapes. It was determined that Griffin was about as smart as a three-and-a-half year old human. Not bad for having a brain the size of a walnut. Lucy was taught how to eat normal meals at the table using silverware. She could dress herself, often choosing to wear skirts just like her "mother" did. She could even make tea for her "parents" and the team of researchers who trained and cared for her. Dr. Robert Fouts, one of the groundbreaking psychologists who taught American Sign Language (ASL) to Washoe the chimp in 1967, helped Lucy learn to communicate using around 250 ASL signs. Lucy could not only give the signs for objects like airplane, ball, and food, but she could also express her emotions with her hands, often "saying" when she was hungry, happy, or sad. It's a sad fact that once a captive chimp has reached about four or five years old, their immense strength can become a danger to their human caretakers. Often they need to be placed in a zoo, a lab, or some other facility better equipped to handle primates. In this case, the Temerlins raised Lucy as their daughter until 1977, when she was almost 12 years old, before they finally felt like they had to find her a new home. After much deliberation, they decided upon a nature preserve in Gambia on the west coast of Africa. They, along with research assistant Janis Carter, flew with Lucy to her new home to help ease the chimp into the wild. However, it was not going to be as simple as they'd hoped. She wasn't eating because her food had always been delivered to her on a plate; she didn't even understand the concept of foraging. When her parents suddenly became distant and weren't providing her with the life she had always known, Lucy became confused and sad. She would often use the sign for "hurt." And she lost much of her hair due to the stress of her new situation. Realizing that Lucy would never move on if they stayed, her parents left her behind after three weeks. Janis agreed to stay for a few weeks longer, but it was soon clear that Lucy couldn't change who she was. And so, Janis never left. Mental Floss: How do you transport a whale? For most, the new lifestyle quickly became second nature. But for nearly eight years, Lucy refused to give up her human ways. She wanted human food, human interaction, and to be loved by, what she considered, one of her own kind. It wasn't until Janis stopped living on the island that Lucy was finally able to accept her new life and joined a troupe of chimps. Sadly, Lucy's decomposed body was discovered in 1987. Her exact cause of death is unknown, though some believe she was killed by poachers. Others say it was probably something less spectacular, like an attack by a dominant male or an illness. There's one thing that no one who knew her wonders about, though, and that's the fact that Lucy never really believed she was anything less than human.